Spring – where every day is a balmy 40 degrees, foggy, and there is enough moisture in the air to water a hibiscus. It also means that civilization is beginning to wander back outdoors for some fresh air as the great thaw begins to settle in. For those who work in the city, it means street vendors, spontaneous musical performances, and jumping at every opportunity to get out of the office and enjoy the nicer weather. Spring also provides an in between period of winter and summer where we come out of hibernation and begin to refocus our free time on being active and getting rid of those unwanted winter pounds. According to a study by Johns Hopkins, the average American can gain anywhere between five and seven pounds during the winter months. Add this to a typical 40 hour work week, family, and other extracurricular activities and that those unwanted pounds can add up rather quickly. The good news is there are plenty of ways we can integrate daily exercise into our already busy schedules and get back on track to a healthier lifestyle. 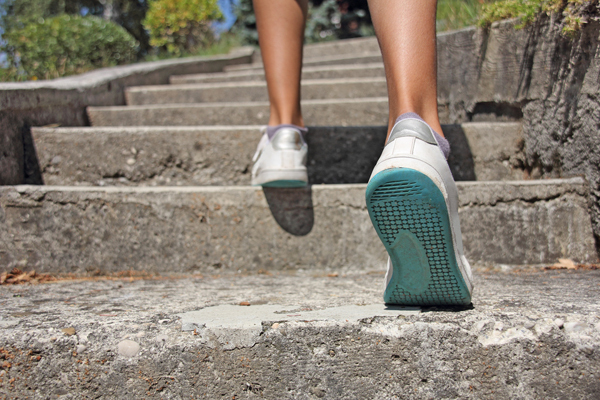 Did you know, it takes approximately 10,000 steps to burn 1lb of fat? For an average adult standing 5’9”, that comes out to roughly five and a half miles! Couple this activity with a healthy diet and you have the recipe for success. Stairs are the secret weapon nobody knows about. We see stairs every day and, chances are, we do not even take the time to use them. They are in our offices, parking garages, entertainment facilities, restaurants, etc. How can we know that progress is being made if we don’t track our performance? There are lots of great tools to help track your daily exercise. Pedometers are a great way to measure the number of steps you take and you can find them at your local fitness store for under $20. There is also a great app for iPhone and Android called Moves that uses the technology in your phone to count steps as well – the best part is, it’s FREE. Studies have shown that those who exercise with a partner are nearly twice as motivated to continue with their routine than those who exercise alone. So find someone who shares in your fitness goals and exercise together. It sounds crazy, but who doesn’t love getting some cool new gear? Whenever I get something new I want to use it all the time. So try jump starting your mentality with a new pair of walking shoes. You can get your daily dose of exercise and look good doing it! Exercise requires hard work and dedication. But, that doesn’t mean you can’t reward yourself after a long week of hard work. Reward yourself with a day of rest or some time off doing something you enjoy.